Does your Variable Frequency Drive application require a variable torque or constant torque drive? If the equipment being driven is centrifugal, such as a fan or pump, then a variable torque drive will be more appropriate. One primary VFD Benefit and usually the primary motivation for installing Variable Frequency Drives for centrifugal applications is energy savings, and variable torque drives offer the greatest energy savings. For example, a fan needs less torque when running at 50% speed than it does when running at full speed. Variable torque operation allows the motor to apply only the torque needed, which results in reduced energy consumption. Conveyors, positive displacement pumps, punch presses, extruders, and other similar type applications require constant level of torque at all speeds. In which case, constant torque variable frequency drives would be more appropriate for the job. A constant torque drive should have an overload current capacity of 150% or more for one minute. Variable torque variable frequency drives need only an overload current capacity of 120% for one minute since centrifugal applications rarely exceed the rated current. 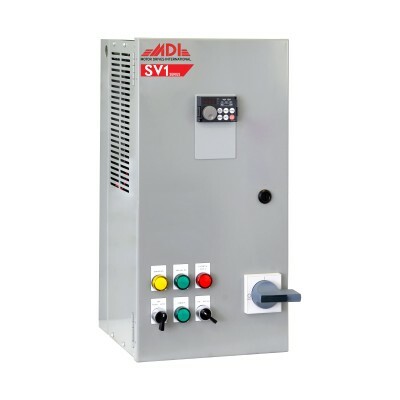 When buying a VFD for a system needing tight process control, then you may need to look into purchasing a sensorless vector, or flux vector Variable Frequency Drive, which allow a high level of accuracy in controlling speed, torque, and positioning. Full Load Amp Rating. Using a motor's horsepower is an inaccurate way to size variable frequency drives. Speed Range. Generally speaking, a motor should not be run at any less than 20% its specified maximum speed allowed. If it is run at a speed less than this without auxiliary motor cooling, the motor will overheat. Auxiliary motor cooling should be used if the motor must be operated at slow speeds. Multiple Motors. To size a variable frequency drive that will control more than one motor, add together the full-load amp ratings of each of the motors. All motors controlled by a single drive must have an equal voltage rating. If you need to supply a 3-phase drive with single-phase power, then the drive should be derated by 25% to 50% of its current-handling ability, which may require you to specify a larger-sized drive. 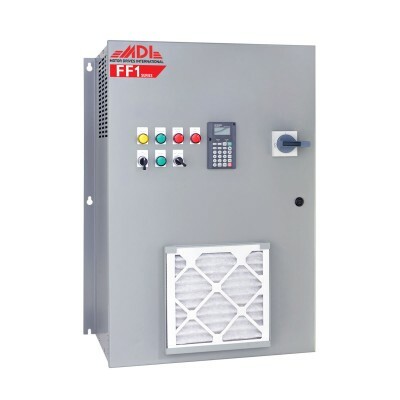 With 2-wire control, only one switch is used to run the variable frequency drive. An open switch stops the drive, and a closed switch starts the drive. Two-wire control is predominately used in HVAC applications since t is able to maintain the RUN command to the drive during a loss of power, which enables Variable Frequency Drives to automatically restart when power is restored. Plus, 2-wire control allows drives that have "power loss ride-through" to operate during a power drop that is 2 seconds or less in duration. With 3-wire control, two switches are used to run the drive. One switch is needed to stop, and another to start the variable frequency drive. This allows an auxiliary contact from the start to "seal in" the RUN command, just like your more conventional motor starters. Speed Potentiometer. Allows the operator to set motor speed with pot. Digital Programming / Display Unit. Allows the operator to program and troubleshoot the drive by inputting values through a keypad with an LED or LCD display unit. Drive operation can also be monitored through this display. Analog Signal Follower. 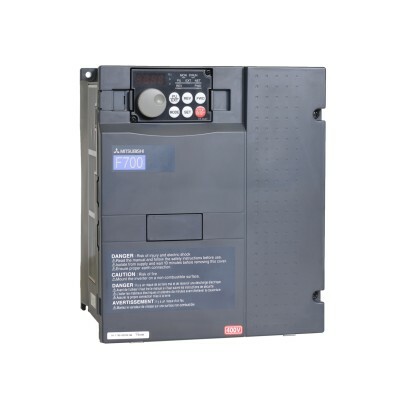 4-20mA or 0-10VDC; must provide variable frequency drives with an isolated input; must use a twisted/shielded pair and keep wire away from 3-phase AC. Selector switch speed selection. Allows operator to select from several preset speeds. Can also be used if the speed is being set via a PLC, and an analog output is not available. Serial Communications. Allow variable frequency drives to communicate on a network, such as MODBUS, PROFIBUS, DEVICENET, or METASYS, enabling drive operation to be coordinated and monitored from a PC. A drive should have an efficiency rating of 95% or better at full load. Variable frequency drives should also offer a true system power factor of 95% or better across the operational speed range, to avoid penalties from the power utility, save on energy bills, and to protect you equipment (especially motors). Motor overload for instantaneous trip and motor over current. Additional Protection: Over voltage, under voltage, over temperature, ground fault, control or microprocessor fault. These protective circuits should provide an orderly shutdown of the VFD, provide indication of the fault condition, and require a manual reset (except under voltage) before restart. Under voltage from a power loss shall be set to automatically restart after return to normal. The history of the previous three faults shall remain in memory for future review. If a built-up system is required. 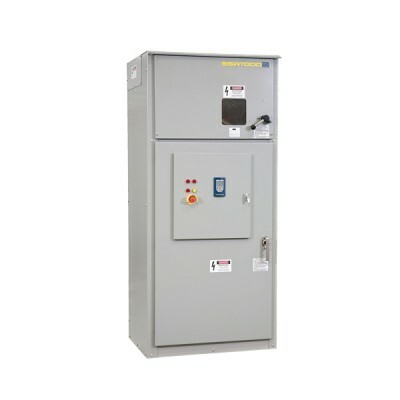 there should also be externally-operated short circuit protection, door-interlocked fused disconnect, circuit breaker or motor circuit protector (MCP) rated at a minimum of 65,000 AIC, and a door-interlocked handle capable of being locked. If you have a single phase motor, VFDs will not work. If you have a three phase motor with single phase power, you will need find a 3 phase VFD that is twice as big in amps (to the motor) for it to work. This process is called derating. Because manufacturers do not make single phase VFD that big. 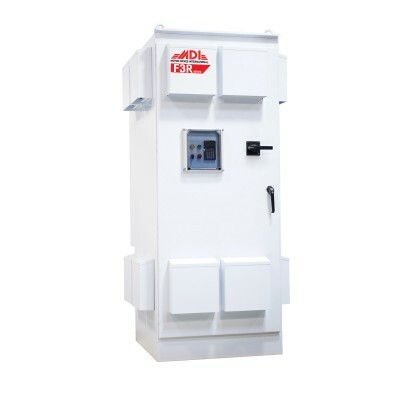 For example, if your 100kW motor has an FLA of 180A, you will typically need a VFD with 360A or higher for it to work. Does that make sense? Can you tell me what is your application?